Ringo Star at the kick off of the exhibit “Ringo: Peace & Love” held at the Grammy Museum in Los Angeles, CA on Tuesday, June 11, 2013. Photo by Michael Hixon. 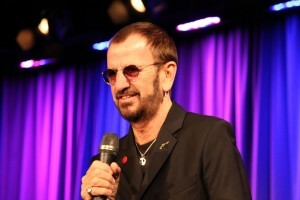 HOLLYWOOD—Ringo Starr, one of only two living Beatles, was on hand at the Grammy Museum in Los Angeles Tuesday to kick off the exhibit “Ringo: Peace & Love,” the first major display of the musician’s memorabilia. The 72-year-old was in top form, dressed in all black, wearing his trademark sunglasses indoors. He joked and reminisced with an audience of journalists from around the world. The limited-run exhibit, which opens Wednesday, June 12, offers visitors an unprecedented in-depth look at all aspects of Starr’s musical and creative life—as a musician, artist, actor, and as the man the world knows and loves simply as Ringo. It also emphasizes Starr’s universal message of peace and love. 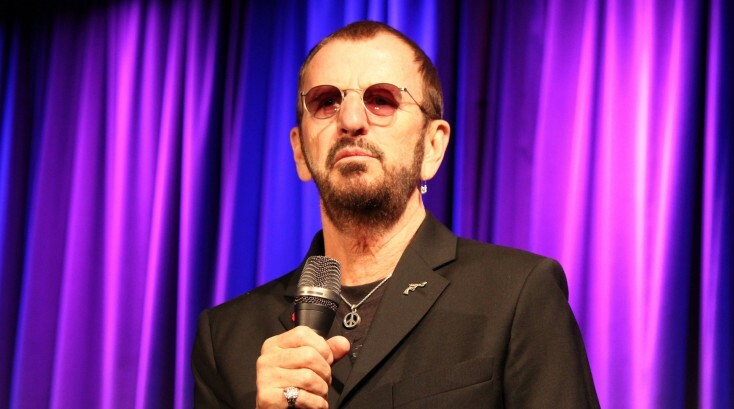 The scope of the exhibit spans Ringo’s early life growing up in Liverpool, from his music with Rory Storm’s Raving Texans and Hurricanes groups, the Beatles, his career as a solo artist and mostly recently his tenure his All-Starrs with whom he continues to tour. The next leg of his world tour picks up in Latin America this fall, with concert dates set in Brazil, Uruguay, Paraguay, Argentina, Peru and Mexico before he and his band head to the United States for a two-night gig Nov. 22-23 at The Palms in Las Vegas. The Grammy Museum exhibit is a unique collection that brings together diverse artifacts, rare and never before seen photographs (some taken by Ringo), documents, personal letters and footage. Q: How did this exhibit come about? Ringo: I have to thank (my wife) Barbara (Bach) because at the start of last year, out of the blue, we decided we would archive my stuff. We did it in a very charming way. 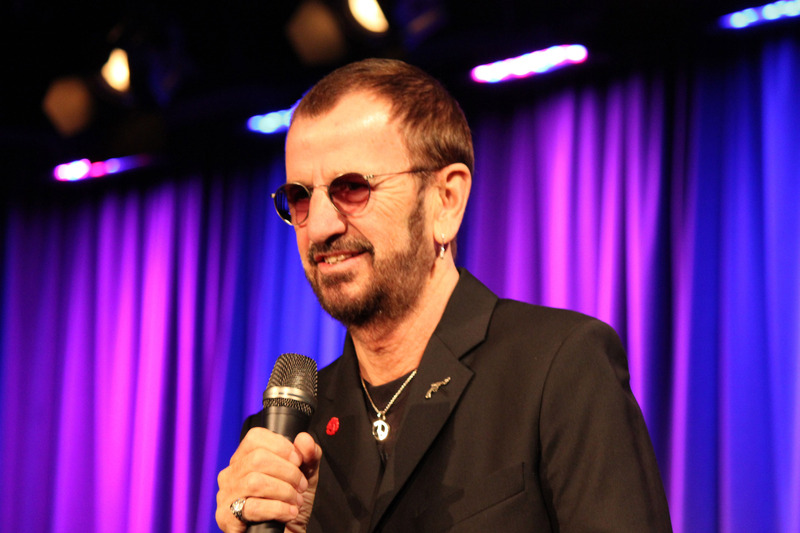 Then out of the blue, Bob (Santelli, executive director of the museum) asked if we could have a meeting and said, “Let’s have a Grammy Museum exhibit on Ringo.” We did have to work a lot harder after he said that, and a lot faster, because we had a (deadline) on it. Oh yeah, here’s a shirt. Q: What did you find the most fascinating about compiling the items for the exhibit? Ringo: The most incredible thing about putting it together was that I found so much stuff I didn’t know I had. So I’d like to thank two assistants I’ve had over the years. They put (the items) in hanging bags and boxes and trunks. And it was like in several trunks and places on the planet. And we pulled it all together. Q: Are you a packrat? Ringo: I didn’t personally say, “I’ve got to save that. I’ve got to do this. I’ve got to look after it.” It was just tossed aside, in many ways, a lot of it. When we started looking what we found was incredible. We were looking through stuff and putting them away. There were lots of other people helping us out. And I had these two boxes from my mother. My mother died in 1986, and I took these two boxes away and I did not open them until last year. I thought we’d better look in there. It was like a labyrinth cave. First of all, there was the letter I got from Rory Storm shows you what it’s like to be on stage. He’s written to me to tell me we’re playing on Thursday night. We didn’t have (cell phones) and we didn’t have a (land) phone. So he says “we’re playing Thursday night at the Jive Hive. I’ll bring your cymbals and your money.” So, of course, I went. Q: What was it like for you as a struggling musician before the Beatles? Ringo: I didn’t have a car. It was difficult for a drummer in those days not to have one. I’d take the snare drum to the gigs. I begged a drummer who had his whole kit there, “Let’s use your kit, man.” Sometimes they said yes and sometimes they said no. When I did get a car, and would be able to take my kit to the venues, other drummers would ask me, “Can I use your kit, man?” And I’d say, “sure.” To the musicians in the audience, if I let someone use my kit and he sat on the drum stool and he put his foot on the bass drum beater, it was like he was starting a motorbike. So then I’d say, “Excuse me. Get off!” Anyway, that’s how it was. I’m real happy that we have this exhibit. A lot of people are involved. I’d like to say I did it all, but I got a lot of help. Q: What does it mean to you to have an exhibit at the Grammy Museum? Ringo: It’s the only place. I’m a musician. It should be here. We had the drum in the Metropol a couple of years ago in New York. The Rock ‘n’ Roll Hall of Fame had a couple of my pieces, but the Grammy (Museum) was an exact place for me, I thought. I can do it in all honesty here, because it is The Grammy Museum and it’s music. That’s what I do; I play music. Q: When you were collecting these artifacts and strolling down memory lane, what did Richard Starkey (Starr’s real name) learn about Ringo Starr? Ringo: He really learned that he loves the drums. That’s all I ever wanted to play. I didn’t want to play anything else. From when I was 13, I wanted to play drums. Several years later when I got some real drums—bring in the violins. I was asked the other day, “What is your main thing—is it drumming, is it singing?” And it’s always been playing the drums. That’s what I do. Q: What are your feelings about the Beatles musical legacy you helped create? Ringo: Yeah. I love it. I do love it because I’m really proud of the music we made. It took a while, but we were very serious players, and the results are still being played today. That’s what’s great. (Grammy Museum director) Bob talked about those very young grandfathers of 65 and their kids (coming to the museum). (He chuckles.) It’s still going on. How great is that? The memories I have of those days are … I’d like to say every minute was great but it wasn’t. But, overall, the emotion was great. We worked hard. We only wanted to be musicians. We didn’t sit around and say, “Let’s be famous.” We said, “Let’s be musicians.” So, as you all know, unless you’re from another planet, the Beatles became very famous. That was part of it but the music is most important thing you do. Q: Who was your idol growing up? Ringo: The main hero of mine was Lightnin’ Hopkins. I loved the blues. Life is weird, if you haven’t heard the story, when I was 18, I went to the American consulate in Liverpool because I wanted to move to Houston, Texas, because Lightnin’ was from there. I was working at a factory at the time and looking at factory jobs in Houston. We went to the embassy and they gave us all these forms to fill out. So we filled them out—this friend of mine and I—and went back and gave them these forms, and then they gave us more forms. We didn’t know. Life is a strange path; you’re just on it. Q: It was almost 50 years ago when the Beatles had a summit meeting with Elvis in Hollywood. Did you jam with him? Ringo: We didn’t jam with Elvis. I don’t know who said that. The big memory was we walked in and he was on the settee watching TV, and he had a TV commander (remote control), and he was like, “Wow!” We were fans of Elvis. When he came in, he was just incredible. For me, I grew up watching Bill Haley and a lot of other guys, but they all seemed like your dad. But Elvis, for me, was the first one that wasn’t like my dad. He was just a couple of years older. That’s all. We didn’t jam and we didn’t play American football. Although him and his guys did. We didn’t know how to play that. Q: After the “A Hard Day’s Night” film, there was a lot of pressure for you to do a follow up. Can you speak about how the recording of “Help!” came about and your recording of the album? Q: When is “Let it Be” coming out on DVD or Blu-ray?